The Department for Transport (DfT) has responded to criticism from charity leaders who have accused ministers of stalling on the issue of pavement parking. They point out that it has been 1,000 days since ministers said they would take action on the issue – a reference to a ministerial pledge that led to Simon Hoare MP withdrawing his private members' bill in December 2015. 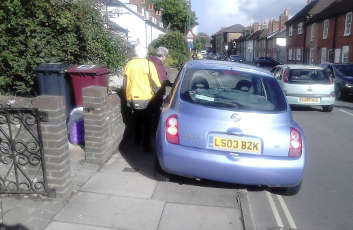 In England outside London, pavement parking is not banned by default but councils can make Traffic Regulation Orders (TROs) to impose local bans. The DfT said roads minister Jesse Norman commissioned a review into pavement parking in March and it is now gathering evidence on the issue and the effectiveness of current regulations. As part of this work, it is considering alternative methods to tackle inappropriate pavement parking. It said it expects to conclude this work later this year. A spokesperson said: ‘We recognise the importance of making sure that pavement parking doesn’t put pedestrians at risk, and believe councils are best placed to make decisions about local restrictions. The DfT’s 2017 Cycling and Walking Investment Strategy listed among ‘Recent Achievements: convening a round-table meeting in March 2016 to consider the practicalities (including the financial and legal implications) of how to improve pavement parking controls’.